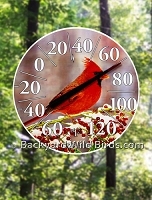 Backyard bird indoor / outdoor thermometer and window thermometer with artistic Wild Bird designs on them. Also classy indoor Galileo Thermometer and a decorative metal Weathered Copper Thermometer. Assorted suction cup window Thermometer's make a nice gift and way to see the temperature. 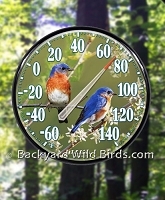 This Bluebird Outdoor Thermometer is a James Hautman 12 1/2 in. Indoor Outdoor Thermometer. 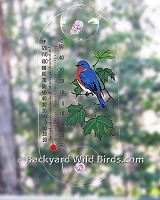 Window thermometer with Bluebird on maple branch is an Indoor Outdoor thermometer. Cardinal Easy Read Thermometer makes quite an attractive displayed. The Cardinal high definition Thermometer is a top quality Indoor/Outdoor Dial instrument that uses large easy to read numbers. 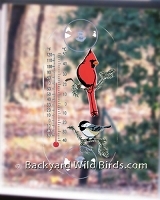 Cardinal Outdoor Thermometer is an James Hautman 12.5 in. 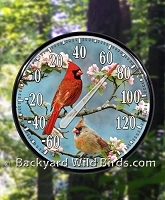 artistic Cardinal Indoor Outdoor Thermometer. Copper Clock with Thermometer is an indoor outdoor clock with Fahrenheit thermometer and Humidity hygrometer. The quartz based clock has large black Arabic numbers on a cream dial. 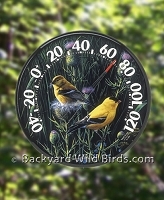 Goldfinch Outdoor Thermometer is 12.5 in. artistic Indoor Outdoor thermometer from the Audubon Collection. 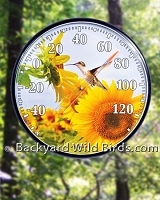 Hummingbird Thermometer with Hummingbird and Sunflowers richly displayed. What a gorgeous way to see the temperature ouside. Window thermometer with a Hummingbird and Azalea on front is an Indoor Outdoor thermometer. Outdoor Thermometer Big Numbers is a designer edition outdoor and indoor thermometer. Perfect for any place where easy reading from a distance is important. 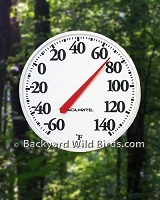 Songbird Outdoor Thermometer is an James Hautman 12.5 in. 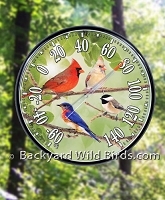 artistic 5 Songbird group Indoor Outdoor Thermometer. 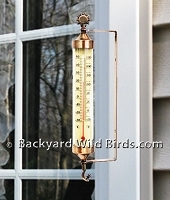 Weathered Copper Thermometer is a decorative metal thermometer. The weathered copper finish thermometer is easy-to-read, easy-to-mount, and heavy guage capillary tube assures accuracy.